Longtime BBR Friend, Rich Taylor, Launches New Goggle Line. Here is a sneak peek of Rich Taylor's line of Goggles. - The “GOX” goggle is a product of over 25 years of eyewear experience. The world-class design of the “GOX” goggle has all of the necessary features that a high-end goggle requires to keep you seeing your way clear to the finish line. - A lightweight, “urethane blend” frame has a firm yet pliable feel for the ultimate in comfort and protection. - The “GOX” frame is equipped with the highest quality, Polycarbonate, shatter resistant anti-scratch & anti-fog coated lens available. It has 100% UVA protection and it is the leader in lens attributes and function. - Lenses available in a variety of colors as well as light sensitive. - Every “GOX” goggle package comes standard with two lenses. A mirrored, gray tint lens that is anti-fog coated for bright riding situations and an extra clear anti-fog coated lens in the box. - Tear off posts are integrated into the Polycarbonate, hard coat lenses for ease of use and function. - 100-PPI “reticulated” vent foam allows the ultimate in airflow while keeping the dust and debris out. This special vent foam is designed to allow moisture and condensation to escape freely. - An adjustable, double buckle woven strap is silicone backed for the ultimate in strap placement and hold. - 17mm thick, 4-layer face-foam is backed with a moisture wicking fleece lining providing the best anti drip, sweat protection available. - “Anti static” smudge resistant goggle bag. - The “X-Grom” was designed to give kids and smaller face shapes a quality goggle with all the comforts, looks and protection of a full size goggle. - “Polyflex”, urethane frame contours to the face for comfort and protection. - Wind channels are molded into the frame to direct air into the “reticulated” vent foam for added airflow and less condensation build up. - The “X-Grom” comes standard with a woven goggle strap that is silicone backed for the ultimate in placement and hold. - Hydrophilic EO15 face foam contours to the face with an amazing seal and moisture wicking comfort. - The “X-Grom” is equipped with a clear, anti-fog coated, scratch resistant, shatter resistant .030, Polycarbonate lens that has 100% UVA protection. 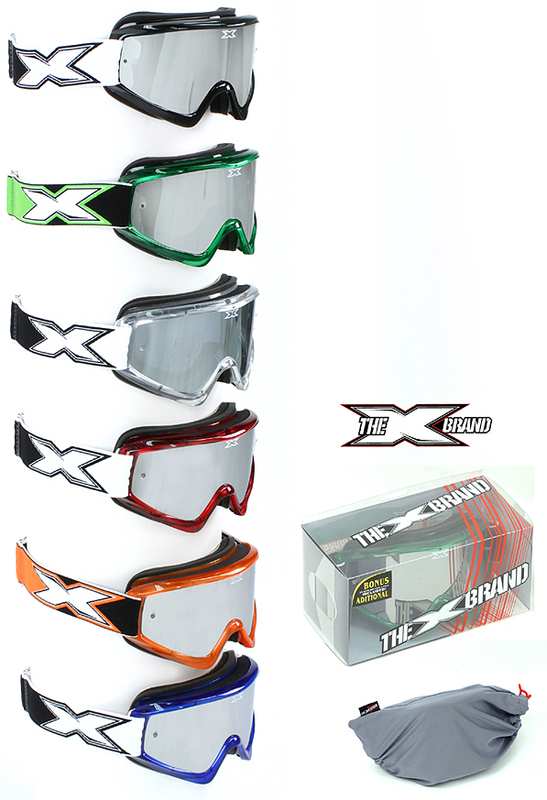 - The creators of The X Brand designed the “Xit” goggle with two things in mind, function and price. The “Xit” goggle has a general face fit with all of the features needed for excellent protection and added comfort. - Pliable “Polyflex” urethane frame material contours to your face for the ultimate in comfort and protection. - Adjustable double buckle woven strap is silicone backed for excellent placement and hold. - “Hydrophilic” EO15 face-foam forms to the face with an amazing seal and moisture wicking comfort. - The “Xit” goggle comes standard with a blue tint, anti-fog coated, Polycarbonate lens that has 100% UVA protection. - Keep an eye on style and protection while watching your budget with the “Xit” goggle! The X Brand offers a wide variety of lens choices. All X Brand lenses are made from the highest quality polycarbonate material and are all ANTI-FOG COATED! All mirrored lenses are ANTI-FOG coated and made of the highest quality Polycarbonate material. All light sensitive lenses are ANTI-FOG coated and made of the highest quality Polycarbonate material. The Light sensitive lens turns from a clear to persimon tint in a matter of seconds! 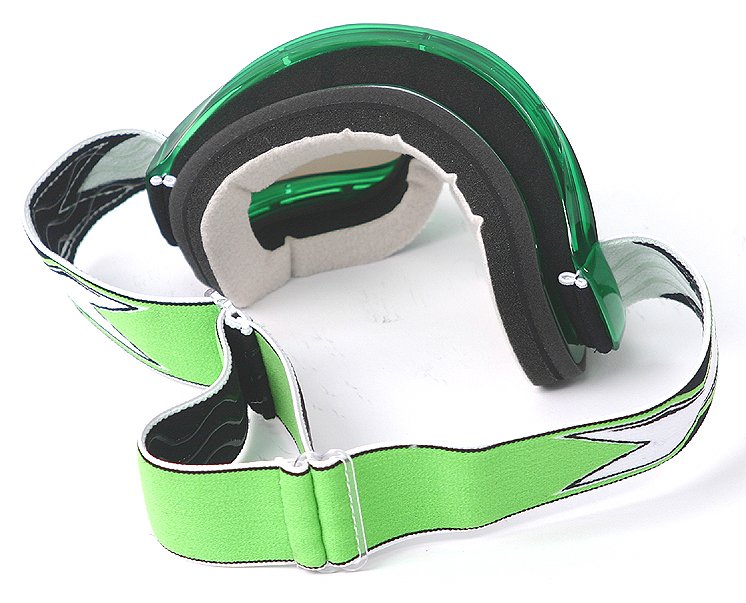 The X Brand offers the “Quick Snap” tearoff system for the “GOX” goggle as well as the X-GROM goggle. The integrated lens tearoff posts allow the tearoff’s to be loaded easily with a quick action release for a confident pull. The X Brand tearoff’s come in packs of 12 with easy guide instructions included.